Here's the second Hellboy artbook. It's not the sequel to The Art of Hellboy that was released in 2004 though. Hellboy: The First 20 Years is a 20th anniversary artbook to celebrate the character and title that Mike Mignola created. So unlike that 2004 artbook, this one features just art without any commentary. What you'll see are mostly cover art for Hellboy, B.P.R.D, and some from Abe Sapien, Witchfinder and others. Selected pieces have sketches provided, not a lot, and there also also some comic partially inked comic panels. There are about 20 pieces or pages of art from before 2005, and the rest are from the last ten years. The art is fantastic of course. The style is very recognisable Mike Mignola. Striking and bold. Lovely use of blacks that really suits the mood of the comic and character. Even Peter de Seve who wrote the introduction also drew in similar style for his guest art. There are a few watercolour pieces that look really different from the others. It's a nice hardcover artbook. 136 pages. Large and tall format to fit the typical comic book dimensions so that the covers can be reproduced big, and they are reproduced very well in this book. 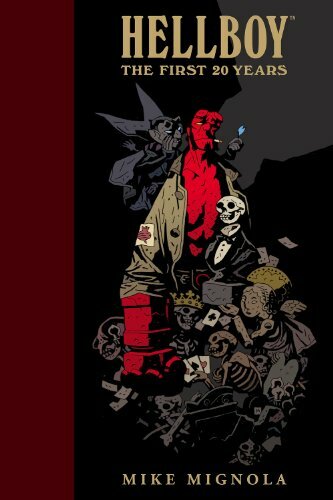 It's a fantastic book for fans of Hellboy and Mike Mignola.